Econsultancy has done a good job of comparing and reviewing the ticket booking customer interfaces of UK’s three leading cinema chains: Cineworld, Odeon and Vue. This review has relevance for ticket booking experience over the web for every country, even though restricted to just three in one territory. The author compares the web and mobile portals for ease-of-use, speed of booking, seat selection, repeat use and payment options. While it is worth reading the whole review, including the good use of screen shots, we won’t spoil your fun by revealing that Odeon fared worst, while Vue did well but Cineworld scored highest of the three. Link. Laser projection: News from the HPA Tech Retreat by THR’s Carolyn Giardina that laser projection may have cleared a regulatory hurdle in the US. “Speaking at the HPA Retreat, Lude reported that international standards body International Electrotechnical Commission (IEC) “is well on its way to redefining what a laser projector is,” meaning that laser projectors would no longer be considered a laser emission device. Instead, they would fall under lamp regulation, possibly as early as spring, he said. In the U.S. this classification would eliminate the need for a variance to use a laser projector, and so LIPA is encouraging the FDA to quickly adopt the IEC revision (when completed).” Good news for brighter 3D pictures. Link. India/subtitling: Digitisation has leading to falling costs for subtitling, which in turn allows for wider distribution of (non-Hindi/Bollywood) Indian films. “Producers are learning that a film’s market widens with some investment in subtitling. Until recently, subtitling was a sidelined function in moviemaking and dominated by the NFDC (National Film Development Corporation of India). Sanjay Wadhwa of AP International, a leading distributor of Tamil films in overseas markets, said after the rise of India’s software industry, there are numerous requests to subtitle films from the West. “Initially, we were unable to do so because the cost of subtitling then was about Rs 75,000 per print—more than the cost of the actual print,” says Wadhwa.” Link. India: It is election year in the world’s most populous democracy and politicians in southern Indian state of Tamil-Nadu are busy currying favours with voters, including the promise of cheap or free cinema. “As the ticket charges are high in most of the cinema halls in Chennai and since many of them are being operated from commercial complexes, the Chennai Corporation would establish cost affordable cinema theatres to provide entertainment to people. Vacant spaces available at various places at Corporation of Chennai would be identified and ‘Amma Cinema Theatres’ would be established for the benefit of poor and middle class people.” Far from being ‘high’ even by Indian standards, ticket prices are regulated and capped by the Tamil state. Link. USA: Marcus Theatre’s plans to serve alcohol in its Fargo cinema is running into some local resistance. “Serving alcohol in one of the city’s major first-run movie theaters might be a tough concept for some here to swallow. But even if city officials sign off on the plan, a cut rate on the liquor license the theater owner proposed appears to be a total flop.” Link. Belgium: Kinepolis’ revenue is down in account of the cinema attendance downturn in its target markets, but profits are still up. “Belgian cinema operator Kinepolis reported slightly higher profits in 2013 despite fewer visitors as average customers spent more on snacks, drinks and merchandise per trip and overhead costs dipped. The group said on Thursday that it had 18.2 million admissions to its cinemas in 2013, 7.9 percent fewer than in 2012. It said the decline was due to a lack of strong local films in France, weak consumer spending and a VAT rise in Spain and severe winter weather at the start of the year as well as a hot summer in both Belgium and France.” Link. India: Innovative initiative with India’s leading multiplex operator. “In a first of its kind initiative in India, The Children’s Film Society of India (CFSI) has tied-up with PVR Cinemas to release four of its latest films on book-a-show basis. The films available for screening under the initiative are: Goopi Gawaiiiya Bagha Bajaiiya , Kaphal, Woh and Gattu. Under the initiative, schools and other organizations can book a show for any of these CSFI films at a PVR cinema. Tickets will cost Rs.100 and shows can be booked for minimum 100 people, at least 2-3 weeks in advance.” Link. USA: DCD is not feeling the love from analysts. “Digital Cinema Destinations Corp (NASDAQ:DCIN) was downgraded by Zacks from a “neutral” rating to an “underperform” rating in a report issued on Wednesday, AnalystRatingsNetwork.com reports. They currently have a $5.50 price target on the stock. Zacks‘ target price suggests a potential downside of 4.35% from the company’s current price.” Link. Russia: Cinema sites going for sale in Moscow. “Moscow to Announce Auctions for Cinema Sites – February 19, 2014, 16:14, (Property Xpress) – Moscow authorities are planning to put 15 cinemas for auction, head of the city property department Vladimir E” The rest of the article is behind a paywall 🙁 Link. 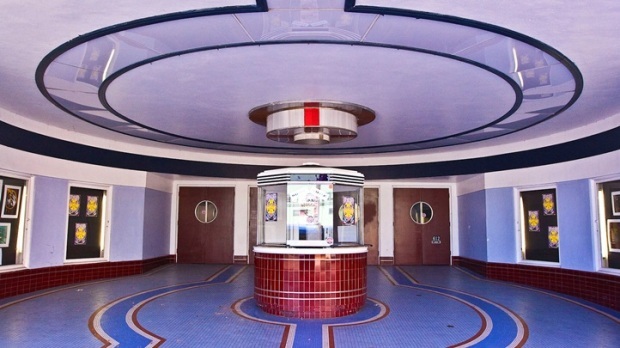 USA: One of San Francisco’s most gorgeous art-deco cinemas celebrates a big anniversary. “Take the Eureka Theater in Humboldt County. The venue, built by San Francisco architect William David, is a visual symphony of Art Deco charm. As many movie palaces were, back in the day, but a lot of those no longer exist. But the Eureka does, in Eureka, and it is turning 75 with a prices-rollback party.” Enjoy classic films for just 35 cents. Link. Hong Kong: A cinema opening that deserves a special mention. Profiled by Variety’s Asia correspondent Patrick Frater, this multiplex is trying to reverse the trends of shrinking cinema numbers in Hong Kong, “Leading property developer Hopewell Group has this week opened The Metroplex, a multiplex which aims to reinvigorate Hong Kong’s movie-going scene. The 9-screen complex is housed within the Kowloon International Trade & Exhibition Centre (KITEC) near Hong Kong’s iconic, but now defunct, old Kai Tak airport. Aiming for the highest possible technical standards, the complex includes six large and medium-sized theaters (pictured) and three 20-seat VIP screens. Each is equipped with 4K digital projectors and Dolby 7.1 Surround. Five also boast Dolby Atmos systems.” Sounds very impressive. Link. Germany: FJI’s Andreas Fuchs has a no-less excellent write-up of the re-opening of the Zoo Palast cinemas. As well as installing the latest digital projection, Dolby Atmos and generous legroom ,attention is also paid to staffing and services. ““In everything we do,” Flebbe feels, “we are different from the way in which multiplexes operate. With the Zoo Palast we have tried to turn everything that was considered negative into a positive experience. As a direct result, our guests are generally older than the average moviegoer and very, very satisfied with what we offer to them.” One of the means to accomplish that level of satisfaction is to “have twice the staff that other cinemas consider workable. And that includes a huge cleaning crew that sweeps in after the shows. We also have auditorium supervisors, all dressed in black of course, that check about every 15 minutes whether all is good during the film. If someone is on the cellphone or otherwise interruptive, they ask them to stop. If guests do not oblige, we politely ask them to leave. It has happened, not very often, but we are enforcing the policy.”” Link. UK: “FURTHER details have been revealed of Northwich’s planned ODEON Cinema as excitement mounts among residents. The five-screen multiplex will seat more than 760 people, with its largest screen holding 271 and its smallest just 80. The remaining three screens will seat 115, 146 and 152 people.” Link. USA: “Plans for construction of a new multiplex theater in the Gateway Commons development on North Jefferson Street gained approval from city council Tuesday evening… Barnette Development, LLC, which owns a similar movie complex in Logan County, plans to build an eight-screen theater with stadium seating that will accommodate 1,000 patrons. The Gateway Commons site on which the theater will be built is 3.26 acres, contained within two parcels totaling 17.24 acres controlled by Barnette Development.” Link. CineStalgia: A look back at the cinemas and films that made history in UK’s Bournemouth. “THERE have been state-of-the-art cinemas in Bournemouth’s Westover Road practically as long as there have been talking pictures. Today, the Odeon group – which owns both the Odeon and the nearby ABC – is signed up to plans for a multiplex at the former bus station in Exeter Road. A Facebook group, Save Bournemouth Odeon, is campaigning to keep the cinemas where they are. And wherever you stand on that debate, the campaign has brought to light some vivid memories and pictures of the 85 year history of film-going on Westover Road.” Link.